WASHINGTON (AP) Nationals ace Max Scherzer has been pulled from his start against Pittsburgh because of an apparent injury to his right leg. The NL East champions didn’t provide immediate word on the extent of Scherzer’s condition Saturday night. Scherzer stumbled on a 2-2 pitch to Josh Bell in the fourth inning. Scherzer then began to throw a full-count pitch, but abruptly stopped when time was called. Washington manager Dusty Baker, pitching coach Mike Maddux and team trainers visited the mound and quickly took out Scherzer. This was Scherzer’s final tuneup before the Nationals play the Chicago Cubs in the Division Series beginning Friday. 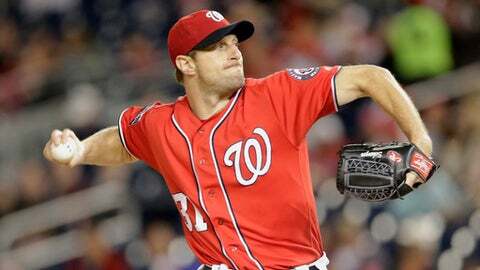 Scherzer leads the National League with 268 strikeouts. He is 16-6 with a 2.51 ERA. The two-time Cy Young winner had given up one hit and struck out five in 3 1/3 scoreless innings when he was hurt.